One of the best values in downtown Telluride! Bedding: Queen bed, split king bed, full sofa sleeper, 2 twin futons. The Manitou Riverhouses are located on the south side of the San Miguel river, a short walk to skiing, dining and shopping. Cross the river via the pedestrian bridge and enter the complex via several stair cases on the east side of the building. 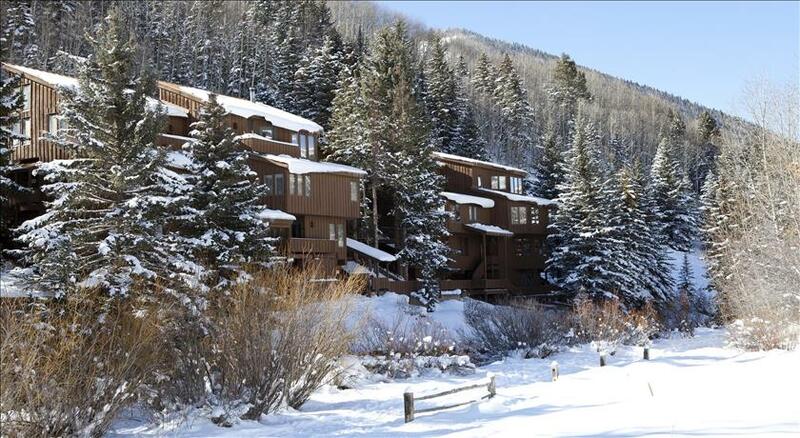 This spacious condo is hidden against tall pines giving it a quiet feel all while being located in the center of Telluride. This 2 bedroom, 2 bath property is a comfortable end unit that overlooks town and the peaceful river. The condo has a full kitchen and access to an indoor hot tub. With accommodations for 8, this is the perfect accommodation for those on a budget, but also want to be near it all. There is large deck off the living room where you can literally ski in if you are brave enough (or just that good).